So, you thought the fictional people-eating great white shark in the film “Jaws” had a powerful bite. But don’t overlook the mighty mouth of the parrotfish – its hardy teeth allow it to chomp on coral all day long, ultimately chewing and grinding it up through digestion into fine sand. That’s right: Its “beak” creates beaches. A single parrotfish can produce hundreds of pounds of sand each year. Now, a study by scientists – including those at the Department of Energy’s Lawrence Berkeley National Laboratory (Berkeley Lab) – has revealed a chain mail-like woven microstructure that gives parrotfish teeth their remarkable bite and resilience. The natural structure they observed also provides a blueprint for creating ultra-durable synthetic materials that could be useful for mechanical components in electronics, and in other devices that undergo repetitive movement, abrasion, and contact stress. Matthew Marcus, a staff scientist working at Berkeley Lab’s Advanced Light Source (ALS) – an X-ray source known as a synchrotron light source that was integral in the parrotfish study – became intrigued with parrotfish during a 2012 visit to the Great Barrier Reef off of the coast of Australia. A sea-life video he watched on an oceangoing tour boat reminded him of the role of parrotfish in breaking down coral into fine sand. They mainly feast on the polyps and algae that live on the surface of coral skeletons, and help to clean up reefs. The hardness of parrotfish teeth measured near the biting surface is about 530 tons of pressure per square inch – equivalent to a stack of about 88 African elephants – compressed to a square inch of space. Back at the ALS, Marcus asked Pupa Gilbert – a biophysicist and professor in the Physics Department at the University of Wisconsin–Madison who studies how living things produce minerals – if she was interested in studying the parrotfish teeth. Gilbert said she “responded enthusiastically” to the challenge. She led an international team in the study, receiving parrotfish beaks from collaborators in French Polynesia. Her collaborators from Nanyang Technical University in Singapore – Ali Miserez, an associate professor who studies biological materials with unique properties, and his group – performed mechanical measurements for the study. Gilbert carried out most of the structural studies to understand how parrotfish teeth work. Marcus served as the first author in this latest study, led by Gilbert and published online Oct. 20 in the journal ACS Nano. Gilbert had previously included Marcus in one of her studies that focused on nacre, the fracture-tough, iridescent coating known as mother-of-pearl that lines the inside of some mollusk shells. Nacre has inspired R&D work to mimic its strength properties using synthetic materials. This and similar studies have relied on a technique known as PIC (polarization-dependent imaging contrast) mapping, which Gilbert invented and continues to develop at the ALS. In PIC mapping, the polarization of X-rays is rotated to enable the analysis and display of nanoscale crystal orientation in nacre and other biominerals. In this latest study, Gilbert, Marcus, and Miserez wanted to see how the fine crystal structure of parrotfish teeth contribute to their incredible strength. The researchers were able to visualize the orientation of individual crystals, which showed their intricately woven structure. Fluorapatite, the mineral responsible for the crystal structure of parrotfish teeth, contains calcium, fluorine, phosphorous, and oxygen. The study showed that the fluorapatite crystals that give parrotfish teeth their strength each measure about 100 nanometers (billionths of a meter) wide and several microns (millionths of a meter) long, and are assembled into interwoven bundles. The bundles decrease in average diameter from about 5 microns to about 2 microns toward the tip of each tooth. In the case of parrotfish, the continuously growing rows of teeth, which form a beaklike structure that constantly replaces older, worn teeth with new teeth, are also integral to their specialized feeding behavior. Only chitons have harder teeth than parrotfish, Gilbert said, and no other biomineral is stiffer than parrotfish teeth at their biting tip. 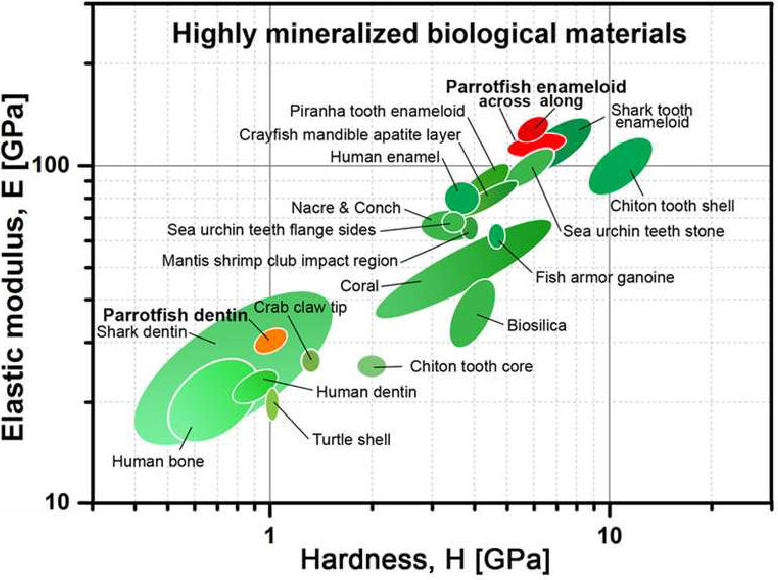 “Parrotfish teeth are the coolest biominerals of all,” Gilbert said. 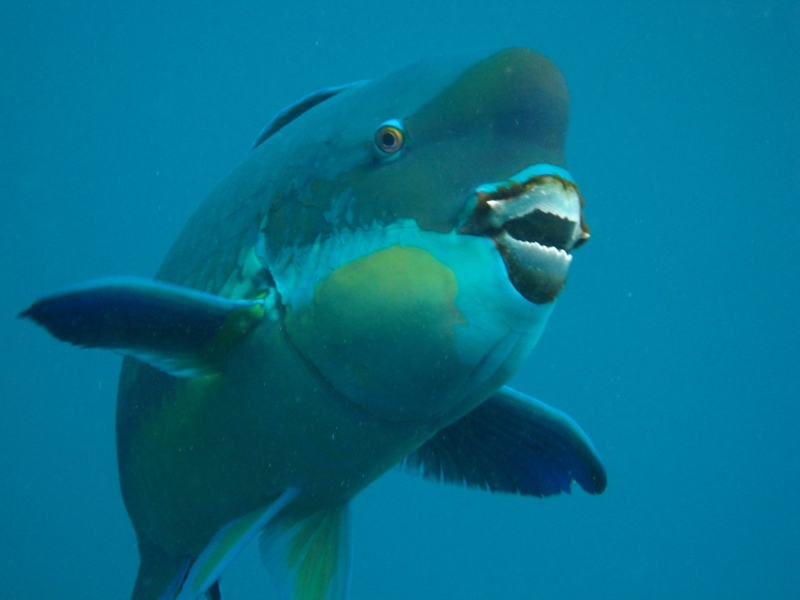 “They are the stiffest, among the hardest, and the most resistant to fracture and to abrasion ever measured.” Parrotfish have about 1,000 teeth situated in about 15 rows, and each tooth is cemented to all of the others and surrounded by bone to form a solid beak – shark’s teeth, by contrast, are not interconnected in this way. The mechanical measurements for the study, which focused on teeth samples from a steephead parrotfish (Chlorurus microrhinos), found that the hardness and stiffness increases toward the tip of each tooth. The PIC mapping experiments at the ALS revealed that as the hardness and stiffness increases, the diameter of the crystal bundles narrows. In addition to the PIC-mapping study, which used a tool known as a photoemission electron microscope (PEEM) at the ALS, separate ALS experiments used a 3-D imaging technology known as X-ray microtomography and another X-ray method known as microdiffraction to further analyze the crystal orientations and strains of the teeth. Already, Gilbert noted, there are many well-developed efforts to replicate the structure of human enamel using nanofabrication methods. Gilbert and Marcus suggested that future experiments at the ALS could focus on a separate set of teeth (pharyngeal teeth) that further break down coral bits in parrotfish throats. The Advanced Light Source is a DOE Office of Science User Facility. Also participating in this study were other scientists at Berkeley Lab’s Advanced Light Source and University of Wisconsin–Madison, along with researchers at Nanyang Technological University in Singapore. The work was supported by the U.S. Department of Energy Office of Science, the National Science Foundation, and the Singapore National Research Foundation.